Modern estimates range from 6,000 to 9,000; see Numbers at Agincourt. • ​1⁄6 dismounted knights and men-at-arms in heavy armour. Modern estimates range from 12,000 to 36,000; see Numbers at Agincourt. • unknown thousands of other infantry, crossbowmen and archers. The Battle of Agincourt (/ˈæʒɪnkɔːr(t), -kʊər/[a] French: Azincourt [azɛ̃kuʁ]) was one of the greatest English victories in the Hundred Years' War. It took place on 25 October 1415 (Saint Crispin's Day) near Azincourt in the County of Saint-Pol, in northern France. [b] England's unexpected victory against a numerically superior French army boosted English morale and prestige, crippled France, and started a new period in the war during which the English began enjoying great military successes. The Battle of Agincourt is well documented by at least seven contemporary accounts, three from eyewitnesses. 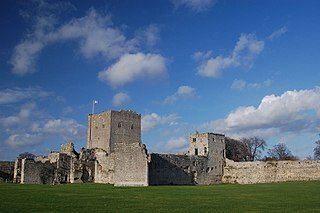 The approximate location of the battle has never been in dispute and the place remains relatively unaltered after 600 years. Immediately after the battle, Henry summoned the heralds of the two armies who had watched the battle together with principal French herald Montjoie, and they settled on the name of the battle as Azincourt after the nearest fortified place. Two of the most frequently cited accounts come from Burgundian sources, one from Jean Le Fèvre de Saint-Remy who was present at the battle, and the other from Enguerrand de Monstrelet. The English eyewitness account comes from the anonymous Gesta Henrici Quinti, believed to be written by a chaplain in the King's household who would have been in the baggage train at the battle. A recent re-appraisal of Henry's strategy of the Agincourt campaign incorporates these three accounts and argues that war was seen as a legal due process for solving the disagreement over claims to the French throne. Henry V invaded France following the failure of negotiations with the French. He claimed the title of King of France through his great-grandfather Edward III, although in practice the English kings were generally prepared to renounce this claim if the French would acknowledge the English claim on Aquitaine and other French lands (the terms of the Treaty of Brétigny). He initially called a Great Council in the spring of 1414 to discuss going to war with France, but the lords insisted that he should negotiate further and moderate his claims. In the following negotiations Henry said that he would give up his claim to the French throne if the French would pay the 1.6 million crowns outstanding from the ransom of John II (who had been captured at the Battle of Poitiers in 1356), and concede English ownership of the lands of Normandy, Touraine, Anjou, Brittany and Flanders, as well as Aquitaine. Henry would marry Catherine, the young daughter of Charles VI, and receive a dowry of 2 million crowns. The French responded with what they considered the generous terms of marriage with Catherine, a dowry of 600,000 crowns, and an enlarged Aquitaine. By 1415, negotiations had ground to a halt, with the English claiming that the French had mocked their claims and ridiculed Henry himself. In December 1414, the English parliament was persuaded to grant Henry a "double subsidy", a tax at twice the traditional rate, to recover his inheritance from the French. On 19 April 1415, Henry again asked the Great Council to sanction war with France, and this time they agreed. Henry's army landed in northern France on 13 August 1415, carried by a fleet described by Shakespeare as "a city on the inconstant billows dancing / For so appears this fleet majestical". It was often reported to comprise 1,500 ships, but probably far smaller. The army of about 12,000, and up to 20,000 horses besieged the port of Harfleur. The siege took longer than expected. The town surrendered on 22 September, and the English army did not leave until 8 October. The campaign season was coming to an end, and the English army had suffered many casualties through disease. Rather than retire directly to England for the winter, with his costly expedition resulting in the capture of only one town, Henry decided to march most of his army (roughly 9,000) through Normandy to the port of Calais, the English stronghold in northern France, to demonstrate by his presence in the territory at the head of an army that his right to rule in the duchy was more than a mere abstract legal and historical claim. He also intended the manoeuvre as a deliberate provocation to battle aimed at the dauphin, who had failed to respond to Henry's personal challenge to combat at Harfleur. The French had raised an army during the siege which assembled around Rouen. This was not strictly a feudal army, but an army paid through a system similar to the English. The French hoped to raise 9,000 troops, but the army was not ready in time to relieve Harfleur. After Henry V marched to the north, the French moved to block them along the River Somme. They were successful for a time, forcing Henry to move south, away from Calais, to find a ford. The English finally crossed the Somme south of Péronne, at Béthencourt and Voyennes  and resumed marching north. Without a river obstacle to defend, the French were hesitant to force a battle. They shadowed Henry's army while calling a semonce des nobles, calling on local nobles to join the army. By 24 October, both armies faced each other for battle, but the French declined, hoping for the arrival of more troops. The two armies spent the night of 24 October on open ground. The next day the French initiated negotiations as a delaying tactic, but Henry ordered his army to advance and to start a battle that, given the state of his army, he would have preferred to avoid, or to fight defensively: that was how Crécy and the other famous longbow victories had been won. The English had very little food, had marched 260 miles (420 km) in two and a half weeks, were suffering from sickness such as dysentery, and faced much larger numbers of well-equipped French men-at-arms. The French army blocked Henry's way to the safety of Calais, and delaying battle would only further weaken his tired army and allow more French troops to arrive. The actual location of the battle is not known. It may be in the narrow strip of open land formed between the woods of Tramecourt and Azincourt (close to the modern village of Azincourt). However, the lack of archaeological evidence at this traditional site has led to suggestions it was fought to the west of Azincourt. In 2019, the historian Michael Livingston also made the case for a site west of Azincourt, based on a review of sources and early maps. The English made their confessions before the battle, as was customary. Henry, worried about the enemy launching surprise raids, and wanting his troops to remain focused, ordered all his men to spend the night before the battle in silence, on pain of having an ear cut off. He told his men that he would rather die in the coming battle than be captured and ransomed. Henry made a speech emphasising the justness of his cause, and reminding his army of previous great defeats the kings of England had inflicted on the French. The Burgundian sources have him concluding the speech by telling his men that the French had boasted that they would cut off two fingers from the right hand of every archer, so that he could never draw a longbow again. Whether this was true is open to question; as previously noted, death was the normal fate of any soldier who could not be ransomed. The French force was not only larger than that of the English, but their noble men-at-arms would have considered themselves superior to the large number of archers in the English army, whom the French (based on their experience in recent memory of using and facing archers) considered relatively insignificant. For example, the chronicler Edmond de Dyntner stated that there were "ten French nobles against one English", ignoring the archers completely. Several French accounts emphasise that the French leaders were so eager to defeat the English (and win the ransoms of the English men-at-arms) that they insisted on being in the first line; as one of the contemporary accounts put it: "All the lords wanted to be in the vanguard, against the opinion of the constable and the experienced knights." The French were arrayed in three lines or battles. The first line was led by Constable d'Albret, Marshal Boucicault, and the Dukes of Orléans and Bourbon, with attached cavalry wings under the Count of Vendôme and Sir Clignet de Brebant. The second line was commanded by the Dukes of Bar and Alençon and the Count of Nevers. The third line was under the Counts of Dammartin and Fauconberg. 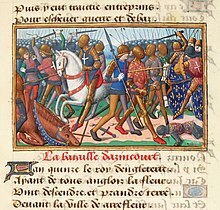 The Burgundian chronicler Jean de Wavrin said there were 8,000 men-at-arms, 4,000 archers and 1,500 crossbowmen in the vanguard, with two wings of 600 and 800 mounted men-at-arms, and a main battle comprising "as many knights, esquires and archers as in the vanguard", with the rearguard containing "all of the rest of the men-at-arms". The Herald of Berry gave figures of 4,800 men-at-arms in the first line, 3,000 men in the second line, with two "wings" containing 600 mounted men-at-arms each, and a total of "10,000 men-at-arms", but does not mention a third line. Wavrin gives the total French army size as 50,000: "They had plenty of archers and crossbowmen but nobody wanted to let them fire [sic]. The reason for this was that the site was so narrow that there was only enough room for the men-at-arms." A different source says that the French did not even deploy 4,000 of the best crossbowmen "on the pretext they had no need of their help". The field of battle was arguably the most significant factor in deciding the outcome. The recently ploughed land hemmed in by dense woodland favoured the English, both because of its narrowness, and because of the thick mud through which the French knights had to walk. Accounts of the battle describe the French engaging the English men-at-arms before being rushed from the sides by the longbowmen as the mêlée developed. The English account in the Gesta Henrici says: "For when some of them, killed when battle was first joined, fall at the front, so great was the undisciplined violence and pressure of the mass of men behind them that the living fell on top of the dead, and others falling on top of the living were killed as well." Although the French initially pushed the English back, they became so closely packed that they were described as having trouble using their weapons properly. The French monk of St. Denis says: "Their vanguard, composed of about 5,000 men, found itself at first so tightly packed that those who were in the third rank could scarcely use their swords," and the Burgundian sources have a similar passage. As the battle was fought on a recently ploughed field, and there had recently been heavy rain leaving it very muddy, it proved very tiring to walk through in full plate armour. The French monk of St. Denis describes the French troops as "marching through the middle of the mud where they sank up to their knees. So they were already overcome with fatigue even before they advanced against the enemy". The deep, soft mud particularly favoured the English force because, once knocked to the ground, the heavily armoured French knights had a hard time getting back up to fight in the mêlée. Barker states that some knights, encumbered by their armour, actually drowned in their helmets. On the morning of 25 October, the French were still waiting for additional troops to arrive. The Duke of Brabant (about 2,000 men), the Duke of Anjou (about 600 men), and the Duke of Brittany (6,000 men, according to Monstrelet), were all marching to join the army. For three hours after sunrise there was no fighting. Military textbooks of the time stated: "Everywhere and on all occasions that foot soldiers march against their enemy face to face, those who march lose and those who remain standing still and holding firm win." On top of this, the French were expecting thousands of men to join them if they waited. They were blocking Henry's retreat, and were perfectly happy to wait for as long as it took. There had even been a suggestion that the English would run away rather than give battle when they saw that they would be fighting so many French princes. The tightness of the terrain also seems to have restricted the planned deployment of the French forces. The French had originally drawn up a battle plan that had archers and crossbowmen in front of their men-at-arms, with a cavalry force at the rear specifically designed to "fall upon the archers, and use their force to break them," but in the event, the French archers and crossbowmen were deployed behind and to the sides of the men-at-arms (where they seem to have played almost no part, except possibly for an initial volley of arrows at the start of the battle). The cavalry force, which could have devastated the English line if it had attacked while they moved their stakes, charged only after the initial volley of arrows from the English. It is unclear whether the delay occurred because the French were hoping the English would launch a frontal assault (and were surprised when the English instead started shooting from their new defensive position), or whether the French mounted knights instead did not react quickly enough to the English advance. French chroniclers agree that when the mounted charge did come, it did not contain as many men as it should have; Gilles le Bouvier states that some had wandered off to warm themselves and others were walking or feeding their horses. The French cavalry, despite being disorganised and not at full numbers, charged towards the longbowmen, but it was a disaster, with the French knights unable to outflank the longbowmen (because of the encroaching woodland) and unable to charge through the forest of sharpened stakes that protected the archers. John Keegan argues that the longbows' main influence on the battle at this point was injuries to horses: armoured only on the head, many horses would have become dangerously out of control when struck in the back or flank from the high-elevation long range shots used as the charge started. The mounted charge and subsequent retreat churned up the already muddy terrain between the French and the English. Juliet Barker quotes a contemporary account by a monk of St. Denis who reports how the wounded and panicking horses galloped through the advancing infantry, scattering them and trampling them down in their headlong flight from the battlefield. 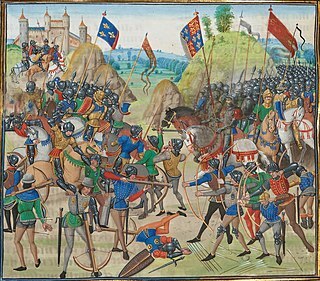 King Henry V at the Battle of Agincourt, 1415, by Sir John Gilbert in the 19th century. The plate armour of the French men-at-arms allowed them to close the 1,000 yards or so to the English lines while being under what the French monk of Saint Denis described as "a terrifying hail of arrow shot". A complete coat of plate was considered such good protection that shields were generally not used, although the Burgundian contemporary sources distinguish between Frenchmen who used shields and those who did not, and Rogers has suggested that the front elements of the French force used axes and shields. Modern historians are divided on how effective the longbow fire would have been against plate armour of the time, with some suggesting that arrows could not penetrate, especially the better quality steel armour, but others suggesting arrows could penetrate, especially the poorer quality wrought iron armour. Rogers suggested that the longbow could penetrate a wrought iron breastplate at short range and penetrate the thinner armour on the limbs even at 220 yards (200 m). He considered a knight in the best-quality steel armour invulnerable to an arrow on the breastplate or top of the helmet, but vulnerable to shots hitting the limbs, particularly at close range. In any case, to protect themselves as much as possible from the arrows, the French had to lower their visors and bend their helmeted heads to avoid being shot in the face, as the eye- and air-holes in their helmets were among the weakest points in the armour. This head-lowered position restricted their breathing and their vision. Then they had to walk a few hundred yards (metres) through thick mud and a press of comrades while wearing armour weighing 50–60 pounds (23–27 kg), gathering sticky clay all the way. Increasingly, they had to walk around or over fallen comrades. The surviving French men-at-arms reached the front of the English line and pushed it back, with the longbowmen on the flanks continuing to shoot at point-blank range. When the archers ran out of arrows, they dropped their bows and using hatchets, swords and the mallets they had used to drive their stakes in, attacked the now disordered, fatigued and wounded French men-at-arms massed in front of them. The French could not cope with the thousands of lightly armoured longbowmen assailants (who were much less hindered by the mud and weight of their armour) combined with the English men-at-arms. The impact of thousands of arrows, combined with the slog in heavy armour through the mud, the heat and difficulty breathing in plate armour with the visor down, and the crush of their numbers meant the French men-at-arms could "scarcely lift their weapons" when they finally engaged the English line. The exhausted French men-at-arms were unable to get up after being knocked to the ground by the English. As the mêlée developed, the French second line also joined the attack, but they too were swallowed up, with the narrow terrain meaning the extra numbers could not be used effectively. Rogers suggested that the French at the back of their deep formation would have been attempting to literally add their weight to the advance, without realising that they were hindering the ability of those at the front to manoeuvre and fight by pushing them into the English formation of lancepoints. After the initial wave, the French would have had to fight over and on the bodies of those who had fallen before them. In such a "press" of thousands of men, Rogers suggested that many could have suffocated in their armour, as was described by several sources, and which was also known to have happened in other battles. The French men-at-arms were taken prisoner or killed in the thousands. The fighting lasted about three hours, but eventually the leaders of the second line were killed or captured, as those of the first line had been. The English Gesta Henrici described three great heaps of the slain around the three main English standards. According to contemporary English accounts, Henry fought hand to hand. Upon hearing that his youngest brother Humphrey, Duke of Gloucester had been wounded in the groin, Henry took his household guard and stood over his brother, in the front rank of the fighting, until Humphrey could be dragged to safety. The king received an axe blow to the head, which knocked off a piece of the crown that formed part of his helmet. The only French success was an attack on the lightly protected English baggage train, with Ysembart d'Azincourt (leading a small number of men-at-arms and varlets plus about 600 peasants) seizing some of Henry's personal treasures, including a crown. Whether this was part of a deliberate French plan or an act of local brigandage is unclear from the sources. Certainly, d'Azincourt was a local knight but he might have been chosen to lead the attack because of his local knowledge and the lack of availability of a more senior soldier. In some accounts the attack happened towards the end of the battle, and led the English to think they were being attacked from the rear. Barker, following the Gesta Henrici, believed to have been written by an English chaplain who was actually in the baggage train, concluded that the attack happened at the start of the battle. Regardless of when the baggage assault happened, at some point after the initial English victory, Henry became alarmed that the French were regrouping for another attack. The Gesta Henrici places this after the English had overcome the onslaught of the French men-at-arms and the weary English troops were eyeing the French rearguard ("in incomparable number and still fresh"). Le Fèvre and Wavrin similarly say that it was signs of the French rearguard regrouping and "marching forward in battle order" which made the English think they were still in danger. A slaughter of the French prisoners ensued. It seems it was purely a decision of Henry, since the English knights found it contrary to chivalry, and contrary to their interests to kill valuable hostages for whom it was commonplace to ask ransom. Henry threatened to hang whoever did not obey his orders. In any event, Henry ordered the slaughter of what were perhaps several thousand French prisoners, sparing only the highest ranked (presumably those most likely to fetch a large ransom under the chivalric system of warfare). According to most chroniclers, Henry's fear was that the prisoners (who, in an unusual turn of events, actually outnumbered their captors) would realize their advantage in numbers, rearm themselves with the weapons strewn about the field and overwhelm the exhausted English forces. Contemporary chroniclers did not criticise him for it. In his study of the battle John Keegan argued that the main aim was not to actually kill the French knights but rather to terrorise them into submission and quell any possibility they might resume the fight, which would probably have caused the uncommitted French reserve forces to join the fray, as well. Such an event would have posed a risk to the still-outnumbered English and could have easily turned a stunning victory into a mutually-destructive defeat, as the English forces were now largely intermingled with the French and would have suffered grievously from the arrows of their own longbowmen had they needed to resume shooting. Keegan also speculated that due to the relatively low number of archers actually involved in killing the French knights (roughly 200 by his estimate), together with the refusal of the English knights to assist in a duty they saw as distastefully unchivalrous, and combined with the sheer difficulty of killing such a large number of prisoners in such a short space of time, the actual number of French prisoners put to death may not have been substantial before the French reserves fled the field and Henry rescinded the order. The lack of reliable sources makes it impossible to give a precise figure for the French and English casualties (dead, wounded, taken prisoner). The French sources all give 4,000–10,000 French dead, with up to 1,600 English dead. The lowest ratio in these French sources has the French losing six times more men than the English. It has been possible to name at least 500 individuals from the French army killed in the battle and over 300 prisoners. English claims range from 1,500 to 11,000 for the French dead, with English dead put at no more than 100. Barker identifies from the available records "at least" 112 Englishmen killed in the fighting, including Edward of Norwich, 2nd Duke of York, a grandson of Edward III. One widely used estimate puts the English casualties at 450, a significant number in an army of about 8,500, but far fewer than the thousands the French lost, nearly all of whom were killed or captured. Using the lowest French estimate of their own dead of 4,000 would imply a ratio of nearly 9 to 1 in favour of the English, or over 10 to 1 if the prisoners are included. The French suffered heavily. Three dukes, at least eight counts, a viscount, and an archbishop died, along with numerous other nobles. Of the great royal office holders, France lost her Constable, Admiral, Master of the Crossbowmen and prévôt of the marshals. The baillis of nine major northern towns were killed, often along with their sons, relatives and supporters. In the words of Juliet Barker, the battle "cut a great swath through the natural leaders of French society in Artois, Ponthieu, Normandy, Picardy." Estimates of the number of prisoners vary between 700 and 2,200, amongst them the Duke of Orléans (the famous poet Charles d'Orléans) and Jean Le Maingre (known as Boucicault), Marshal of France. Although the victory had been militarily decisive, its impact was complex. It did not lead to further English conquests immediately as Henry's priority was to return to England, which he did on 16 November, to be received in triumph in London on the 23rd. Henry returned a conquering hero, in the eyes of his subjects and European powers outside France, blessed by God. It established the legitimacy of the Lancastrian monarchy and the future campaigns of Henry to pursue his "rights and privileges" in France. Other benefits to the English were longer term. Very quickly after the battle, the fragile truce between the Armagnac and Burgundian factions broke down. The brunt of the battle had fallen on the Armagnacs and it was they who suffered the majority of senior casualties and carried the blame for the defeat. The Burgundians seized on the opportunity and within 10 days of the battle had mustered their armies and marched on Paris. This lack of unity in France allowed Henry eighteen months to prepare militarily and politically for a renewed campaign. When that campaign took place, it was made easier by the damage done to the political and military structures of Normandy by the battle. John I, Duke of Alençon-Perche, the second-in-command after d'Albret. Robert of Bar, Count of Marle and Soissons (nephew of Edward III, Duke of Bar). Gallois de Fougières, Provost Marshal, commemorated as the first French gendarme to lose his life in battle. Jean Le Maingre ("Boucicaut"), the Marshal of France. Charles of Artois (Count of Eu), the French Lieutenant of Normandy and Guyenne. Charles of Orleans (Duke of Orleans-Blois-Valois), a great lord of central France, titular head of the "Armagnac" party. (his brother, John of Orleans (Count of Angoulême-Périgord), another great lord, had been in English captivity since 1412). Arthur de Richemont, brother of John VI, Duke of Brittany, step-brother of Henry V (he was the son of Joan of Navarre, dowager-queen of England). Anne Curry in her 2005 book Agincourt: A New History, argues (based on research into the surviving administrative records) that the French army was about 12,000 strong, and the English army about 9,000, giving proportions of four to three. By contrast, Juliet Barker in her book Agincourt: The King, the Campaign, the Battle (also published in 2005) argues the English and Welsh were outnumbered "at least four to one and possibly as much as six to one". She suggests figures of about 6,000 for the English and 36,000 for the French, based on the Gesta Henrici's figures of 5,000 archers and 900 men-at-arms for the English, and Jean de Wavrin's statement "that the French were six times more numerous than the English". The 2009 Encyclopædia Britannica uses the figures of about 6,000 for the English and 20,000 to 30,000 for the French. The 1911 Britannica use somewhat different figures of 6,000 archers, 1,000 men-at-arms and "a few thousands of other foot" for the English, with the French outnumbering them by "at least four times". While not necessarily agreeing with the exact numbers Curry uses, Bertrand Schnerb, a professor of medieval history at the University of Lille, states the French probably had 12,000–15,000 troops. Ian Mortimer, in his 2009 book 1415: Henry V's Year of Glory, notes how Curry "minimises French numbers (by limiting her figures to those in the basic army and a few specific additional companies) and maximises English numbers (by assuming the numbers sent home from Harfleur were no greater than sick lists)", but agrees that previous estimates have exaggerated the odds, and suggests that "the most extreme imbalance which is credible is fifteen thousand French troops against 8,100 English: a ratio of about two-to-one". However, Clifford J. Rogers, professor of history at the United States Military Academy at West Point, has recently argued that archival records are too incomplete to substantially change his view that the English were outnumbered about 4–1. Juliet Barker also disagrees with Curry's arguments in the acknowledgements section of her 2005 book on Agincourt, saying: "Surviving administrative records on both sides, but especially the French, are simply too incomplete to support [Curry's] assertion that nine thousand English were pitted against an army only twelve thousand strong. And if the differential really was as low as three to four then this makes a nonsense of the course of the battle as described by eyewitnesses and contemporaries." One particular cause of confusion may have been the number of servants on both sides. Mortimer suggests that because there were a much higher proportion of men-at-arms on the French side, the number of non-combatants was much higher. Each man-at-arms could be expected to have a page, who would have ridden one of his spare horses. If the French army had an extra 10,000 mounted men (as opposed to only 1,500 extra for the English), then "the English probably did see an army about three times the size of their own fighting force". It is open to debate whether these should all be counted as non-combatants; Rogers (for example) accepts that the French probably had about 10,000 men-at-arms, but explicitly includes one "gros valet" (an armed, armoured and mounted military servant) per French man-at-arms in his calculation of the odds. 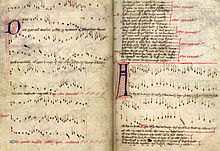 Soon after the English victory at Agincourt, a number of popular folk songs were created about the battle, the most famous being the "Agincourt Carol", produced in the first half of the 15th century. Other ballads followed, including "King Henry Fifth's Conquest of France", raising the popular prominence of particular events mentioned only in passing by the original chroniclers, such as the gift of tennis balls before the campaign. The most famous cultural depiction of the battle today is William Shakespeare's Henry V, written in 1599. The play focuses on the pressures of kingship, the tensions between how a king should appear – chivalric, honest, and just – and how a king must sometimes act – Machiavellian and ruthless. Shakespeare illustrates these tensions by depicting Henry's decision to kill some of the French prisoners, whilst attempting to justify it and distance himself from the event. This moment of the battle is portrayed both as a break with the traditions of chivalry and as key example of the paradox of kingship. Shakespeare's depiction of the battle also plays on the theme of modernity. He contrasts the modern, English king and his army with the medieval, chivalric, older model of the French. Shakespeare's play presented Henry as leading a truly English force into battle, playing on the importance of the link between the monarch and the common soldiers in the fight. The original play does not, however, feature any scenes of the actual battle itself, leading critic Rose Zimbardo to characterise it as "full of warfare, yet empty of conflict." The play introduced the famous St Crispin's Day Speech, considered one of Shakespeare's most heroic speeches, in which Henry delivers movingly to his soldiers just before the battle, urging his "band of brothers" to stand together in the forthcoming fight. Critic David Margolies describes how it "oozes honour, military glory, love of country and self-sacrifice", and forms one of the first instances of English literature linking solidarity and comradeship to success in battle. Partially as a result, the battle was used as a metaphor at the beginning of the First World War, when the British Expeditionary Force's attempts to stop the German advances were widely likened to it. Shakespeare's version of the battle of Agincourt has been turned into (several minor and) two major films, starring Laurence Olivier in 1944 and Kenneth Branagh in 1989. Made just prior to the invasion of Normandy, Olivier's rendition gives the battle what Sarah Hatchuel has termed an "exhilarating and heroic" tone, with an artificial, cinematic look to the battle scenes. Branagh's version gives a longer, more realist portrayal of the battle itself, drawing on both historical sources and images from the Vietnam and Falkland Wars. In his 2007 film adaptation, director Peter Babakitis uses digital effects to exaggerate realist features during the battle scenes, producing a more avant-garde interpretation of the fighting at Agincourt. The battle remains an important symbol in popular culture. For example, a mock trial of Henry V for the crimes associated with the slaughter of the prisoners was held in Washington, D.C. in March 2010, drawing from both the historical record and Shakespeare's play. Participating as judges were Justices Samuel Alito and Ruth Bader Ginsburg. The trial ranged widely over whether there was just cause for war and not simply the prisoner issue. Although an audience vote was "too close to call", Henry was unanimously found guilty by the court on the basis of "evolving standards of civil society". There is a modern museum in Azincourt village dedicated to the battle. The museum lists the names of combatants of both sides who died in the battle. V sign, for more on the "two-finger salute" which legends claim derives from the gestures of longbowmen fighting in the English army at the battle of Agincourt. a. 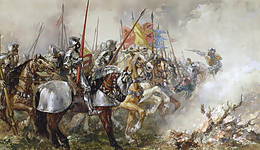 ^ Pronunciation: The story of the battle has been retold many times in English, from the fifteenth-century Agincourt song onwards, and an English pronunciation of /ˈædʒɪnkɔːrt/ has become established. Merriam-Webster has a small audio file here. The modern tendency, however, is to use a style closer to the original French pronunciation French pronunciation: ​[azɛ̃kuʁ], such as /ˈædʒɪnkɔːr/ or /ˈæʒɪnkʊər/, as exampled in this interview with Juliet Barker on Meet the Author, here. b. ^ Dates in the fifteenth century are difficult to reconcile with modern calendars: see Barker 2005, pp. 225–7 for the way the date of the battle was established. c. ^ The first known use of angled stakes to thwart a mounted charge was at the Battle of Nicopolis, an engagement between European states and Turkish forces in 1396, twenty years before Agincourt. French knights, charging uphill, were unseated from their horses, either because their mounts were injured on the stakes or because they dismounted to uproot the obstacles, and were overpowered. News of the contrivance circulated within Europe and was described in a book of tactics written in 1411 by Boucicault, Marshal of France. ^ Barker 2005, p. 227. ^ a b c Curry 2006, p. 192. ^ a b c Barker 2005, p. 320. ^ a b c Curry 2000, p. 12. ^ a b Barker 2005, pp. 337, 367, 368. ^ Keegan 1976, p. 86. ^ Curry 2000, pp. 22–6. ^ Barker 2005, p. 13. ^ Barker 2005, pp. 67–69. ^ Barker 2005, pp. 107, 114. ^ Hibbert 1971, p. 67. ^ Barker 2005, p. 219. ^ Wylie & Waugh 1914, p. 118. ^ Seward 1999, p. 162. ^ a b Mortimer 2009, pp. 436–7. ^ Livingston, Michael (2019). "Where was Agincourt Fought?". Medieval Warfare. IX (1): 20–33. ISSN 2211-5129. ^ Barker 2005, pp. 271, 290. ^ Curry 2006, p. 166. ^ Barker 2005, pp. 267–8. ^ Barker 2005, pp. 283–4. ^ a b Mortimer 2009, p. 422. ^ Rogers 2008b, p. 107. ^ Barker 2005, pp. 276–8. ^ Quoted in Curry 2000, p. 181. ^ Quoted in Curry 2000, p. 159. ^ Quoted in Curry 2000, p. 106. ^ Wason 2004, p. 74. ^ Holmes 1996, p. 48. ^ a b c Curry 2000, p. 37. ^ Quoted in Curry 2000, p. 107. ^ Barker 2005, p. 300. ^ a b Mortimer 2009, p. 449. ^ Mortimer 2009, p. 416. ^ Barker 2005, p. 287. ^ Barker 2005, p. 288. ^ Keegan 1976, pp. 90–1. ^ Barker 2005, p. 273. ^ Barker 2005, p. 291. ^ Keegan 1976, pp. 92–6. ^ Barker 2005, p. 293. ^ Nicholson 2004, p. 109. ^ Rogers 2008, p. 90. ^ Rogers 2008, pp. 110–13. ^ Barker 2005, pp. 297–298. ^ Askew, Graham N.; Formenti, Federico; Minetti, Alberto E. (2012). "Limitations imposed by wearing armour on Medieval soldiers' locomotor performance". Proc. R. Soc. B. 279 (1729): 640–644. doi:10.1098/rspb.2011.0816. PMC 3248716. PMID 21775328. ^ Curry 2000, p. 159. ^ Rogers 2008, pp. 95–8. ^ Mortimer 2009, p. 443. ^ Curry 2006, pp. 207–9. ^ a b Barker 2005, p. 308. ^ Curry 2000, p. 163. ^ Barker 2005, pp. 302–305. ^ Keegan 1976, pp. 107–12. ^ Keegan 1976, p. 112. ^ All figures on number of dead from table in Curry 2000, p. 12. ^ Casualty estimates from the Religeux of St Denis and Jean Juvenal des Ursins given in Curry 2000, p. 12. ^ Barker 2005, pp. x, 321, 323. ^ Barker 2005, pp. 322–3. ^ Mortimer 2009, pp. 475, 479. ^ Mortimer 2009, pp. 547–9. ^ Barker 2005, p. 354. ^ Barker 2005, p. 381. ^ Monstrelet 1853, ch. 147. ^ a b c d Walsingham 2005, p. 412. ^ Barker 2005, p. x. ^ Barker 2005, p. 274. ^ Chisholm 1911, p. 375. ^ a b Glanz 2009. ^ Mortimer 2009, p. 566. ^ Rogers 2008a, pp. 114–21. ^ Barker 2005, p. xvi. ^ a b Mortimer 2009, p. 565. ^ Curry 2000, p. 157. ^ Mortimer 2009, pp. 421–2. ^ Rogers 2008, pp. 60–2. ^ Curry 2000, p. 280–3. ^ Woolf 2003, p. 323. ^ Cantor 2006, p. 15. ^ Cantor 2006, pp. 21–2. ^ Cantor 2006, p. 20. ^ Cantor 2006, p. 16. ^ Hatchuel 2008, p. 193. ^ a b Margolies 2006, p. 149. ^ Adams 2002, p. 31. ^ Adams 2002, p. 183. ^ Hatchuel 2008, pp. 194–5. ^ Hatchuel 2008, p. 195. ^ Hatchuel 2008, p. 200. ^ Treanor, Tim (18 March 2010). "High Court Rules for French at Agincourt". DC Theater Scene. ^ Jones, Andy (8 March 2010). "High Court Justices, Legal Luminaries Debate Shakespeare's 'Henry V'". National Law Journal. ^ "Agincourt". Merriam-Webster Pronunciation. Retrieved 26 October 2014. ^ Jones, Daniel (2003). Roach, Peter; et al., eds. English Pronouncing Dictionary (16th ed.). Cambridge, England: Cambridge University Press. p. 12. ISBN 978-0-521-01712-1. ^ "Juliet Barker". Meet the Author. Archived from the original on 21 February 2014. Retrieved 26 October 2014. ^ Bennett 1994, pp. 7, 15–16. Adams, Michael C. (2002). Echoes of War: A Thousand Years of Military History in Popular Culture. University of Kentucky Press. ISBN 978-0-8131-2240-3. Barker, J. (Oct 2005). Agincourt: The King, the Campaign, the Battle [US title: Agincourt: Henry V and the Battle That Made England]. London: Little, Brown. ISBN 978-0-316-72648-1. Bennett, M. (1994). "The Development of Battle Tactics in the Hundred Years War" (PDF). In Anne Curry; Michael L. Hughes. Arms, Armies and Fortifications in the Hundred Years War. Woodbridge: Boydell Press. pp. 7–20. ISBN 978-0-85115-365-0. Cantor, P. (2006). "Shakespeare's Henry V: From the Medieval to the Modern World in". In John A. Murley; Sean D. Sutton. Perspectives on Politics in Shakespeare. ISBN 978-0-7391-1684-5. Curry, A. (2000). The Battle of Agincourt: Sources and Interpretations. Boydell Press. ISBN 978-0-85115-802-0. Curry, A. (2006) . Agincourt: A New History. UK: Tempus. ISBN 978-0-7524-2828-4. Curry, A.; Mercer, Malcolm, eds. (17 November 2015). The Battle of Agincourt. Yale University Press. ISBN 978-0-300-21430-7. Chisholm, Hugh, ed. (1911). "Agincourt" . Encyclopædia Britannica. 1 (11th ed.). Cambridge University Press. Gilliot, Christophe (2015). "Gallois de Fougières: An esquire during the Hundred Year's War". Medieval Warfare (2015 Special Edition): 59–62. ISSN 2211-5129. Glanz, James (24 October 2009). "Historians Reassess Battle of Agincourt". The New York Times. Hatchuel, Sarah (2008). "The Battle of Agincourt in Shakespeare's, Laurence Olivier's, Kenneth Branagh's and Peter Babakitis's Henry V". In Sarah Hatchuel; Nathalie Vienne-Guerrin. Shakespeare on Screen: the Henriad. Rouen: Laboratoire ERIAC. ISBN 978-2-87775-454-5. Hibbert, Christopher (1971). Great Battles—Agincourt. London: Weidenfeld & Nicolson. ISBN 978-1-84212-718-6. Holmes, Richard (1996). War Walks. London: BBC Worldwide Publishing. p. 48. ISBN 978-0-563-38360-4. Honig, Jan Willem (24 April 2012). "Reappraising Late Medieval Strategy: The Example of the 1415 Agincourt Campaign". War in History. 19 (2): 123–151. doi:10.1177/0968344511432975. Keegan, John (1976). The Face of Battle: A Study of Agincourt, Waterloo, and the Somme. Penguin Classics Reprint. Viking Adult. ISBN 978-0-14-004897-1. Margolies, David (2006). "Henry V and ideology". In Sarah Hatchuel; Nathalie Vienne-Guerrin. Shakespeare on Screen: the Henriad. Rouen: Laboratoire ERIAC. ISBN 978-2-87775-454-5. Monstrelet, E. (1853) . The Chronicles of Enguerrand de Monstrelet. Translated by Thomas Johnes. London: Henry G. Bohn. Mortimer, I. (2009). 1415: Henry V's Year of Glory. London: Bodley Head. ISBN 978-0-224-07992-1. Nicholson, Helen (2004). Medieval Warfare. Palgrave Macmillan. Rogers, C. (29 August 2008). "The Battle of Agincourt". In L. J. Andrew Villalon; Donald J. Kagay. The Hundred Years War (Part II): Different Vistas. History of Warfare. 51. Leiden: Brill. pp. 37–132. ISBN 978-90-04-16821-3. ISSN 1385-7827. Rogers, Clifford J. (2008a). "The Battle of Agincourt: Appendix II". In Villalon, L. J. Andrew; Kagay, Donald J. The Hundred Years War (Part II): Different Vistas. Leiden: Brill. pp. 114–21. Rogers, Clifford J. (2008b). "The Battle of Agincourt". In Villalon, L. J. Andrew; Kagay, Donald J. The Hundred Years War (Part II): Different Vistas. Boston, MA: Brill. p. 107. ISBN 978-90-04-16821-3. Seward, Desmond (1999). The Hundred Years War: The English in France 1337–1453. Penguin. p. 162. ISBN 978-0-14-028361-7. Sutherland, Tim (17 November 2015). "The Battlefield". In Anne Curry; Malcolm Mercer. The Battle of Agincourt. New Haven & London: Yale University Press. ISBN 978-0-300-21430-7. Walsingham, Thomas (2005). "The Reign of King Henry V". In James G. Clark. The Chronica Maiora of Thomas Walsingham (1376–1422). Translated by David Preest. Woodbridge: Boydell Press. ISBN 978-1-84383-144-0. Wason, David (2004). Battlefield Detectives. London: Carlton Books. p. 74. ISBN 978-0-233-05083-6. Woolf, Daniel (12 June 2003). The Social Circulation of the Past: English Historical Culture 1500–1730. Oxford University Press. ISBN 978-0-19-925778-2. Wylie, James Hamilton & Waugh, William Templeton (1914). The Reign of Henry the Fifth. Cambridge: The University Press. p. 118. OCLC 313049420. Beck, Steve (2005). 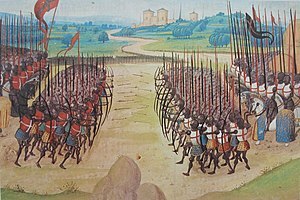 The Battle of Agincourt, www.militaryhistoryonline.com. Bennett, Matthew (2000). "The Battle". In Curry, Anne. Agincourt 1415. Stroud: Tempus. pp. 25–30. ISBN 978-0-7524-1780-6. Dupuy, Trevor N. (1993). Harper Encyclopedia of Military History. New York: HarperCollins. ISBN 978-0-06-270056-8. Family Chronicle.com, The Agincourt Honor Roll, Family Chronicle, March/April 1997. Glanz, James (25 October 2009). "Henry V's Greatest Victory is Besieged by Academia". The New York Times. Retrieved 24 October 2009. Grummitt, David. (Oxford University), A review of Agincourt 1415: Henry V, Sir Thomas Erpingham and the triumph of the English archers ed. Anne Curry, Pub: Tempus UK, 2000 ISBN 0-7524-1780-0. Accessed 15 April 2008. Jones, Michael J. (2005). Agincourt 1415. Barnsley: Pen & Sword. ISBN 978-1-84415-251-3. "Battle of Agincourt" in Military Heritage, October 2005, Volume 7, No. 2, pp. 36 to 43. ISSN 1524-8666. Nicolas, Harris (1833). History of the Battle of Agincourt, and of the expedition of Henry the Fifth into France in 1415; to which is added the Roll of the men at arms in the English army. London: Johnson & Co.
Strickland, Matthew; Hardy, Robert (2005). The Great Warbow. Stroud: Sutton. ISBN 978-0-7509-3167-0. Sutherland, T.L. 2006 'The Battle of Agincourt: An Alternative Location?' Journal of Conflict Archaeology 1, 245–265. Wikimedia Commons has media related to Battle of Agincourt. Azincourt Museum, Le Centre Historique Médiéval, Azincourt, France Accessed 2 December 2017. Battle of Agincourt on In Our Time at the BBC – Bragg, Melvyn (presenter), with Anne Curry, Michael Jones and John Watts, 16 September 2004. Contemporary account of battle written by Enguerrand de Monstrelet (d.1453), governor of Cambrai and supporter of the French crown. Azincourt is a commune in the Pas-de-Calais department in northern France. The Battle of Poitiers was a major English victory in the Edwardian phase of the Hundred Years' War. It was fought on 19 September 1356 in Nouaillé, near the city of Poitiers in Aquitaine, western France. Edward, the Black Prince, led an army of English, Welsh, Breton and Gascon troops, many of them veterans of the Battle of Crécy. They were attacked by a larger French force led by King John II of France, which included allied Scottish forces. The French were heavily defeated; an English counter-attack captured King John II along with his youngest son and much of the French nobility. The English longbow was a powerful medieval type of longbow about 6 ft (1.8 m) long used by the English and Welsh for hunting and as a weapon in medieval warfare. English use of longbows was effective against the French during the Hundred Years' War, particularly at the start of the war in the battles of Sluys (1340), Crécy (1346), and Poitiers (1356), and perhaps most famously at the Battle of Agincourt (1415). They were less successful after this, with longbowmen having their lines broken at the Battle of Verneuil (1424), and being completely routed at the Battle of Patay (1429) when they were charged before they had set up their defensive position. Henry V, also called Henry of Monmouth, was King of England from 1413 until his early death in 1422. He was the second English monarch of the House of Lancaster. Despite his relatively short reign, Henry's outstanding military successes in the Hundred Years' War against France, most notably in his famous victory at the Battle of Agincourt in 1415, made England one of the strongest military powers in Europe. Immortalised in the plays of Shakespeare, Henry is known and celebrated as one of the great warrior kings of medieval England. 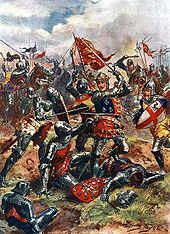 The Battle of Crécy, also spelled Cressy, was an English victory during the Edwardian phase part of the Chevauchée of Edward III of 1346 during the Hundred Years' War. It was the first of three famous English successes during the conflict, followed by Poitiers in 1356 and Agincourt in 1415. The Battle of Neville's Cross took place during the Second War of Scottish Independence on 17 October 1346, half a mile to the west of Durham, England, within sight of Durham Cathedral. An invading Scottish army of 12,000 led by King David II was defeated with heavy loss by an English army of approximately 6,000–7,000 men led by Lord Ralph Neville. The battle was named after an Anglo-Saxon stone cross on the hill where the Scots made their stand; after the victory, Neville paid to have a new cross erected to commemorate the day. Thomas Fitzalan, 12th Earl of Arundel and 10th Earl of Surrey KG was an English nobleman, one of the principals of the deposition of Richard II, and a major figure during the reign of Henry IV. A man-at-arms was a soldier of the High Medieval to Renaissance periods who was typically well-versed in the use of arms and served as a fully armoured heavy cavalryman. A man-at-arms could be a knight or nobleman, a member of a knight or nobleman's retinue or a mercenary in a company under a mercenary captain. Such men could serve for pay or through a feudal obligation. The terms knight and man-at-arms are often used interchangeably, but while all knights equipped for war certainly were men-at-arms, not all men-at-arms were knights. Anthony, Duke of Brabant, also known as Antoine de Brabant, Antoine de Bourgogne and Anthony of Burgundy, was Count of Rethel (1402–1406), Duke of Brabant, Lothier and Limburg (1406–1415), and Co-Duke of Luxemburg (1411-1415). Sir Thomas Erpingham was an English knight who became famous as the commander of King Henry V's longbow wielding archers at the Battle of Agincourt. He was immortalised as a character in the play Henry V by William Shakespeare. It is, however, his lengthy and loyal service to John of Gaunt, Henry IV and Henry V, which contributed significantly to the establishment of the House of Lancaster upon the English throne, that is his true legacy. Thomas of Lancaster, 1st Duke of Clarence was a medieval English prince and soldier, the second son of King Henry IV of England and brother of Henry V. He acted as councillor and aide to both. After the death of his father he participated in the military campaigns of his brother in France during the Hundred Years' War. The Battle of Verneuil was a strategically important battle of the Hundred Years' War, fought on 17 August 1424 near Verneuil in Normandy and a significant English victory. It was a particularly bloody battle, described by the English as a second Agincourt. The Battle of Baugé, fought between the English and a Franco-Scots army on 22 March 1421 at Baugé, France, east of Angers, was a major defeat for the English in the Hundred Years' War. The English army was led by the king's brother Thomas of Lancaster, 1st Duke of Clarence, while the Franco-Scots were led by both John Stewart, 2nd Earl of Buchan, and Gilbert de Lafayette, the Marshal of France. English strength was 4,000 men, although only 1,500 deployed, against 5,000 French and Scots. The Southampton Plot of 1415 was a conspiracy to replace King Henry V with Edmund Mortimer, 5th Earl of March. The Grail Quest is a historical fiction novel series written by Bernard Cornwell dealing with a 14th-century search for the Holy Grail, around the time of the Hundred Years' War. The stories follow the adventures of the fictional Thomas of Hookton as he leaves Dorset after the murder of his father and joins the English Army under Edward III as an archer. In Harlequin he is involved in battle in Brittany and subsequently at the Battle of Crécy. The archers are the first soldiers to be deployed along the crest of the hill at Crécy, providing cover before the battle starts for the knights building a system of ditches, pits and caltrops below to maim and bring down the enemy cavalry. The battle is a decisive victory for the English, even though they were outnumbered. An archer's stake was an anti-cavalry defence used by longbowmen in the 15th and 16th centuries.